I've got a short, albeit acute list of things that make me cry on the spot. I've mentioned them here before. Things like parades and marching bands. Now I've got another bit of kryptonite to add to the list: school gyms, loud music, standing ovations, and my son running with his classmates. Yesterday, I went to cheer Guy on during his school's big "Dragon Dash" fundraiser. 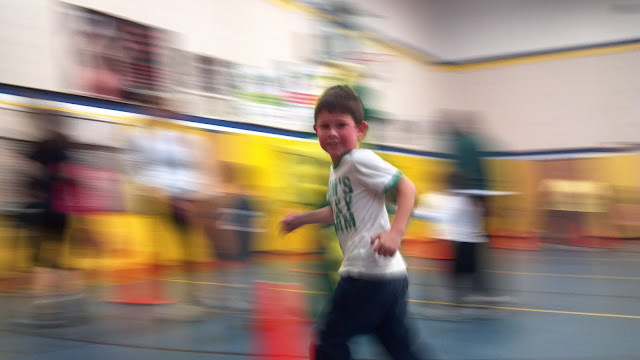 I walked into the gym and saw My Baby Boy having the time of his little life...running, and laughing, and sweating, and smiling, among the crowd of cheering parents and blaring music. And the whole world was moving just a little too quickly for me. I could feel the hot lava of tears starting to bubble up inside of me. (Ok, fine, I was practically bawling! But I did my best to rein it in!) I yelled out Guy's name. He turned to look at me as he sped by...and I took this picture. Even the camera showed him moving at the speed of light. Then I just laughed at myself and thought, yup, this is really happening. I suppose I'd better start moving at the speed of light too, so I can keep up with him! As a side note: I'm never going to survive Parenthood. that is the coolest photo...you couldn't have planned it better to capture the elements of moving. My first baby just turned 46 this week so I can confirm life does travel at the speed of light...enjoy each moment, cry laugh and cherish.. I am totally with you on this...I cry WAY to much when I see my kids getting bigger. I cried the other day when I was in church and my baby wanted to stand on the back of the pew and look back and people and not just sit quitly and take a nap in my arms :( I guess we won't survive together! I was there covering it for the paper, I don't think you were the only parent thinking that from some of the parent's faces I saw. And it just gets better as they grow up! Wait 'til you drop him off at the MTC! I cried buckets--tears of great joy at successfully completing the training of a righteous son and then giving him to the Lord. It was a profound day. Very cool picture! Very precious. The list of things that make me cry is now absurdly long. It started with the song "I Am a Child of God" when my oldest was an infant (14 years ago) and has now grown to include old-fashioned carousels, dolphin shows, the things on your list, and rediculous host of other things now very dear to me. Motherhood made me especially susceptable to Joy. I don't often comment, but I love following your blog. Thanks, Anna! I like how you put that..."Motherhood made me especially susceptible to Joy..." so true! If I was being honest with myself, I'd have to admit that my list is longer than I think...and growing! :) As is my heart and capacity to love! It's painful sometimes, but oh so wonderful! :) Thanks for commenting! I like that, too! Everything makes me cry - any time I feel the slightest tingling of the Spirit I bawl like a baby. I get choked up almost every time I look at a child (not just my own!!) and bawl at even the most normal things (like my kids playing). Children, especially, make me cry. They always have. Children playing, children talking, children praying, singing, playing instruments, reading books, taking in the world. I think that sensitivity to the spirit of children is what made me want to have kids so badly. I think I am worse now that I am a mother - but I think what I felt all my life WAS the spirit of motherhood, and I believe everyone can feel the spirit of motherhood and that increased sense of joy. After all, the love of a mother = Christlike love. So if you can feel Christlike love, I think you can feel like a mother. I had to give up mascara for motherhood - 31 years ago!! I'm always crying - wonderful memories, terrible memories, when they hit a new stage in their (mostly adult) development, during family prayer or any prayer, always during Sacrament. I love your blog, and I like the new comments section, where we get to "like" other comments. You are a great mom - Keep up the good work! during...any prayer! ha ha, I love it. I usually have to keep one eye open to make sure no one's "doing stuff" to each other during the prayer...or eating...or coloring...Thanks for your comment, Jennifer! Oh my gosh so I'm not the only one?! GOOD! I feel so ridicoulus (not sure I spelled that right) at my daughter's music programs at school. As soon as the kids start singing, even before mine does, my eyes start filling ups with tears. Just watching them sing their little hearts out makes me cry. Seeing them so innocent and remembering that not long ago that was me and now I get to experience it. Just knowing that soon they grow up and many make wrong choices makes me so sad! But also just like you said, watching my kids play and have fun makes me cry too! Oh and church and......so many things, too many to type. What a cute boy! I am known to cry at the drop off a hat (more so, right now!) Better than the alternative though! It is so true...they grow up so stinkin fast. I swear it was just yesterday that my first baby was born...he turns 13 in a couple months! Where did that time go??! That picture reminds me of "the Flash!" Cute, cute pic. And I'm the same way. I love seeing my kids making their dream of the moment come true.